Aaron Rodgers had some free time Sunday, as the Packers played in Detroit on Thanksgiving. So how did the injured QB spend his time? He attended the Pacers-Clippers game in Los Angeles … without his mustache. Oh, and he had some pretty sweet seats. 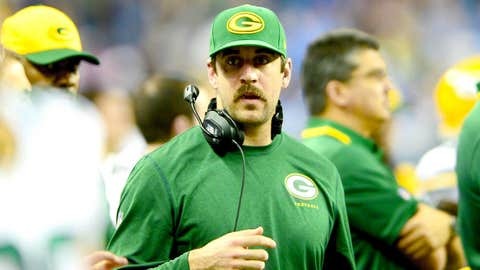 Since Movember is over, some people had a tough time picking Rodgers out of the crowd now that he’s lost his mustache. Aaron Rodgers sitting courtside at the Clippers-Pacers game. I almost didn't recognize him without his mustache. It’s also 2013, which means some people on Twitter were speculating why he’s in Los Angeles. Aaron Rodgers sighting at the Clippers game. Is he seeing a doctor in LA? Rodgers apparently spent some of his time checking in on Sunday’s NFL action.